Cabaret Scenes will present the first International Cabaret Festival, February 17-21 2016, with dozens of performers at clubs across NYC, coming together to celebrate the unique art of cabaret. An opening night Gala will be hosted at Metropolitan Room on Feb. 17 2016 at 7pm, to kick off the Festival as well as celebrate the newly-formed Cabaret Hall of Fame, with a ceremony inducting the following performers: Barbara Carroll, Andrea Marcovicci, Marilyn Maye and Steve Ross, as well as the late Nancy LaMott, Bobby Short, Jan Wallman and Julie Wilson. Gala Performers include: Anita Gillette as well as by Hall of Fame inductees Barbara Carroll, Andrea Marcovicci and Steve Ross. 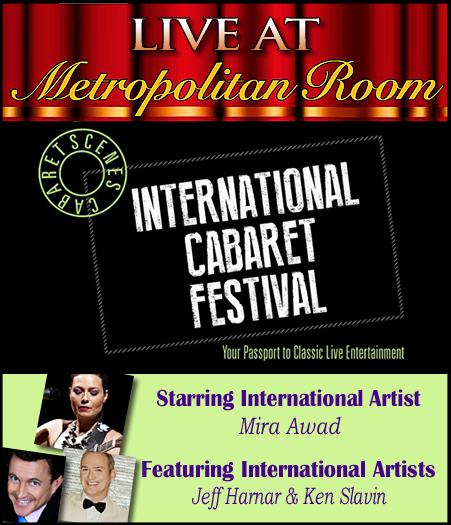 Cabaret Scenes is offering a “Passport” to the International Cabaret Festival, which gives a $5 discount off the cover of every Festival show. It can be purchased through the Cabaret Scenes website at: cabaretscenes.org/2016/01/13/international-cabaret-festival-february-17-21-2016-new-york-city/. The cost is $10 for one passport; $15 for two. The keepsake Passport is fashioned after a travel passport, and includes the complete Festival schedule, information on all of the participating clubs, and pages for stamps from the clubs one attends. A full schedule of the festival appears below. Without a passport, individual show charges and minimums apply.
" This music, with its entrancing sensuality accentuated by the singer’s guttural crooning, was intensely seductive, and I felt drawn into its mysterious spell. Although her songs can be happy, the predominant mood suggested ancient sorrow built into the music. Whether expressing a desire for peace and reconciliation or personal longing, Ms. Awad evoked a world of division, of lovers torn apart, of people waiting for the dawn with a complicated mixture of despair and hope. When Ms. Awad explained the songs in English or translated passages, the sentiments tended to sound banal. But when she sang in Arabic, primal feelings that may be impossible to translate into any language came to the fore." - Stephen Holden, the New-York Times.
" Musician Mira Awad is a defining force within the connective tissue of the play. With voice, drum, and wind instruments, Awad is not so much a guide but a storyteller. Her melodies present the conflicts and experiences of living in the region as well as comment on the action of the action of the play. Awad’s voice is earthy, rich, and deeply grounded. The performance of her original music is affirming and sometimes haunting. With every lilt and bellow, we were asked to see the refugees torn by their journey." - Marcina Zaccaria, Theater Pizzazz. Jeff Harnar is an Award-winning New York cabaret and recording artist who is known for his critically acclaimed engagements at The Algonquin Hotel's Oak Room; Feinstein's at The Regency; The Metropolitan Room and most recently at Birdland and Iridium. His Carnegie Hall appearances include both the Cole Porter and Noel Coward Centennial Galas. He appeared at Carnegie's Weill Recital Hall in a sold-out solo concert, and "A TALENT TO AMUSE" hosted by Sheridan Morely. Most recently he was Michael Feinstein's special guest in his Jule Styne tribute at Carnegie's Zankel Hall. His television appearances include CBS THIS MORNING; "THE 1959 BROADWAY SONGBOOK" (PBS) and as the singing narrator of "GERSHWIN ON ICE" starring Dorothy Hamill (A&E). Jeff began his career at the age of 10 as a television jingle-singer for national commercial spots such as Mattel, Nestle and Kentucky Fried Chicken. Ken made his professional debut on the San Antonio River Walk in 1990 and since those early days, he has become one of the city’s most popular classic jazz singers and has developed a fan base around the world. Although his smooth and intimate vocal style is often favorably compared to noted jazz vocalist Johnny Hartman or such legendary pop singers as Frank Sinatra, Matt Monro and Tony Bennett, he has steadfastly followed his own musical path, successfully finding a unique voice in a highly competitive industry. Jim Beal, former music writer for the San Antonio Express-News, once described Ken this way: “When it comes to crooning in the classic jazz/pop tradition, Ken Slavin has no peers.” Over the past quarter century, Ken’s dedication to singing has paid off in many exciting ways. Last year he became a voting member of The Recording Academy, which produces the GRAMMY Awards. He has produced five CDs, all of which are included on jazz radio playlists around the world and on cable TV’s Music Choice service on the “Singers and Swing” channel. He has opened for such jazz stars as The Four Freshmen, Eddie Palmieri, David Sanborn and Chico Hamilton and performed in concert with the internationally acclaimed Jim Cullum Jazz Band and five-time Grammy Award winners Little Joe y La Familia. And he recently sang with the San Antonio Symphony at the Majestic Theatre during one of Fiesta’s biggest and oldest events: the Coronation of the Queen of the Order of the Alamo. In 2013 he made his New York City debut at the world-famous Metropolitan Room and released a live CD to commemorate the occasion.